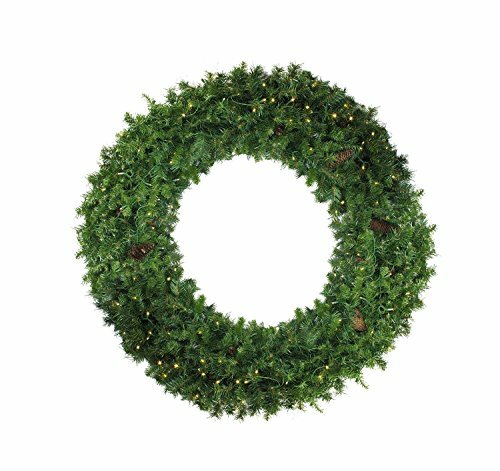 Wreath is beautifully accented with a lush mix of foliage. Longer (3" wide) needle pine tips have two-tone green color which are mixed with shorter (1.5" wide) light green tips for extra dimension and real beauty Accented with pine cones throughout Product Features: Pre-lit with 400 warm white LED lights "Warm whiter" also known as "warm clear" has a soft natural incandescent glow, similar to candlelight Bulb size: mini 1100 tips Commercial size Includes a heavy duty ring metal frame backing for hanging Easy assembly. Wreath comes in 4 pieces with hardware included Additional Product Features: LED lights use 90% less energy Durable non-glass replaceable bulbs Cool to the touch UL listed for indoor or outdoor use Contains 1 plug with end connector which allows you to stack multiple lighted items together (not to exceed 210 watts) Comes with replacement bulbs and spare fuses Wire gauge: 22 Dimensions: 72" diameter (measured from outermost tip to outermost tip across the wreath) Material(s): PVC/metal/plastic bulbs/wire/pine cones"